This stone house was built in 1797 by Peter and Catherine LeFevre. Peter inherited the northern half of this tract, about 300 acres along Herr Road, upon the death of his father, Abraham. A brick addition was added to the east side of the house in 1821 by Peter, Jr. 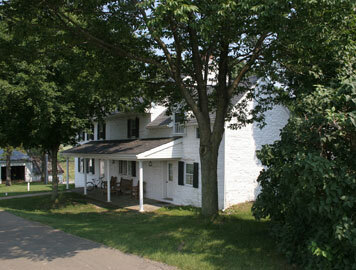 This house is on the property known today as "The Old Homestead Farm and Greenhouses ". Peter LeFevre was a great grandson of Madame. His father was Abraham LeFevre, son of Isaac and Catherine Ferree LeFevre. His mother was Elizabeth Ferree, daughter of Daniel Ferree and Anna Maria Leininger.